available in various colors and a capacity of 2200 mAh or 2600 mAh. For quality control we use Samsung battery for 2600 mAh. Slim power banks are very useful. We offer about 10 different flat power bank models. From 800 mAh to 10,000 mAh. Imprint your logo on the huge printing area. Nature power banks are hot! Engrave your logo on the beautiful wood. 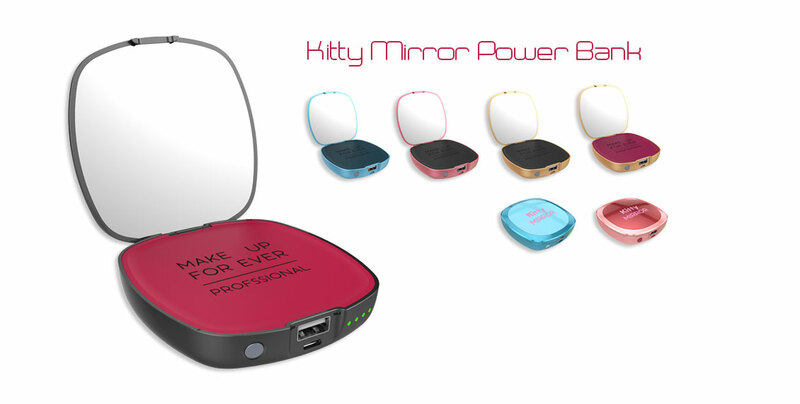 Mirror Power Bank for ladies. MOQ is 100 pcs, imprint or engraving is possible. Lipu Block, West Changfa Rd. ©2016 HM Blue. All Rights Reserved.